Download the Report on World's largest known lab investigation on second hand devices. Excerpts and links may be used, provided that explicit credit is given to Stellar Information Technology Private Limited with appropriate citation and reference link to the original source content. Unauthorized use and/or duplication of this material without prior express and written permission from the author and/or owner is strictly prohibited. BitRaser and Stellar Data Recovery are registered trademarks of Stellar Information Technology Pvt. Ltd. © Copyright 2019 Stellar Information Technology Pvt. Ltd. All Trademarks Acknowledged. 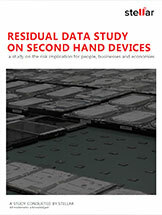 Thank You for downloading Stellar ® Residual Data Study Report on Second Hand Devices. We hope that you'll find the information valuable and insightful. We have sent the download link for the report to your email address. The information submitted through the form will not be used for any kind of promotion or marketing. It only intends to assess general interest in this study report.